Texas Supreme Court Justice Don Willett (left) with the late U.S. Supreme Court Justice Antonin Scalia. 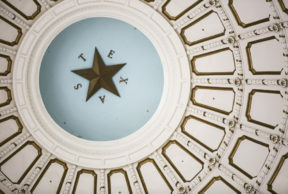 To wit: Texans are waiting for a Supreme Court decision over state abortion restrictions this session, but the court isn’t at full-strength after the passing of Justice Antonin Scalia last year. This raises the possibility of a potential stalemate. And a tie among the highest court in the country doesn’t get a do-over – it just means the lower court ruling stands. But Willett says maybe SCOTUS could learn a thing or two from the state courts. Every state Supreme Court is odd-numbered, but they occasionally find themselves with an even number of judges. But some states have adopted a solution when faced with a supreme stalemate. Willett recently penned a piece in the Wall Street Journal opining on the importance of the Supreme Court providing a backup plan for potential stalemates. Speaking of which: Willett is also on one candidate’s shortlist to replace Scalia. Asked if he’d accept a Trump nomination, Willett says he’s exercising “resolute judicial restraint” in giving an answer. Returning to the topic of tie-breaking, Willett says 16 of the nation’s 50 state Supreme Courts model their approach on SCOTUS, while the other 34 states – Texas included –have a substitute justice procedure. Each of the 34 states’ approaches vary widely, and differ in three important ways. 23 states try to bypass judicial impasses altogether by assigning a substitute judge before the court hears the case. This occurs as soon as the court dips below full strength. In some courts, the chief justice will name a substitute. In other states, the court does collectively. In a few states, Texas included, the governor picks a substitute. And in other states, the court may deputize a staff member to make the selection, thereby curbing accusations of judicial bias. In some states, the pick isn’t a purposeful, intentional selection. Justices may be chosen alphabetically, randomly or rotationally from a pool of eligible appointees. In Louisiana, for instance, there’s a 30-year-old tradition where the court clerk draws a name from a giant plastic Halloween jack-o-lantern. In Washington state, they have a similar process – but they use a crystal or ceramic chalice. In New Hampshire, the court uses a white envelope. Willett says there’s varying degrees of imperfection in all these solutions. “There’s no glitch-free mechanism for resolving impasse,” he says. He proposes that courts keep the selection of a substitute justice in-house. Before each term begins, Willett says the court could collectively name five or six appointees. Then, if the court deadlocks during the term, it could draw a name randomly from that pool.